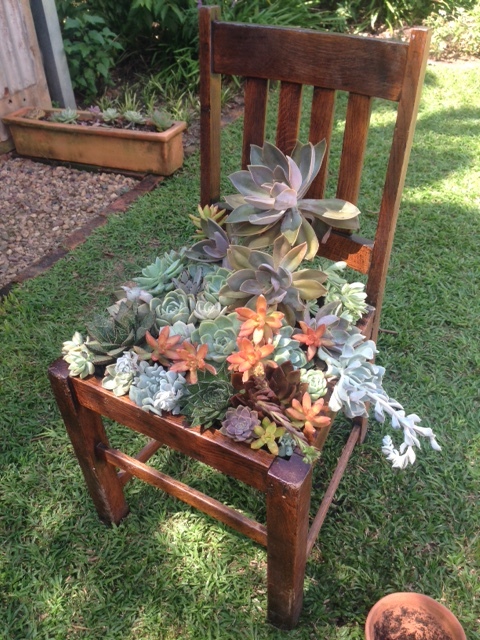 If you have an old dining room chair lying around, why not give new life to it by planting it up with striking succulents! Cut the weed-guard to an estimate size (not to exact size at this point). Staple the weed-guard into place, allowing the cloth to hang deep enough so it can house potting soil and succulents. With the weed-guard stapled into place, you can trim the excess cloth off. Fill up the cavity to about half way with your potting soil mixture. 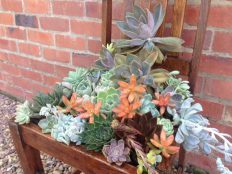 Start placing your bigger succulents first and continue to space and place your succulents until the chair is planted up. With all the succulents in place, carefully add more of your potting soil mixture to fill the gaps, and lightly firm the soil into place. Water thoroughly after planting and enjoy your new succulent chair! 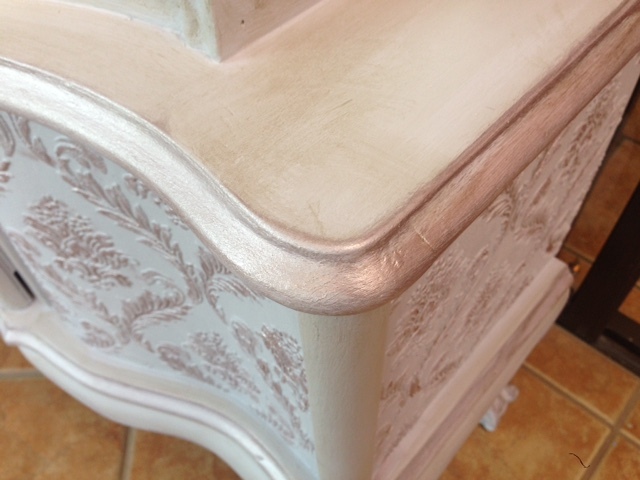 Restoring wooden furniture is really rewarding, as wood has the amazing capability to be replenished. An old forgotten piece can often be brought back to life by using some sandpaper and a wood preservative. Prepare the table by removing any lose objects attached to it – e.g. mosaic tiles. Inspect the table for any damaged areas that will require repair or require strengthening and determine if restoration is possible or paint is in order. Apply paint remover to remove any old paint and varnish in order to restore the wood to its original condition. Follow the relevant product instructions and scrape off using a paint scraper. Once all the paint is removed and cleaned off, give the exposed wooden surface a wipe using mineral turpentine. Locate and fill all the gaps and cavities in the wood with wood filler to ensure a smooth end result. 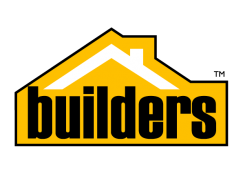 TIP: Be sure to use a similar colour wood-filler if you intend to stain or varnish the wood. A different colour wood-filler will show through the stain. Once the glue and wood-filler is dry, 180g sandpaper can be used to smooth off the wood surface. 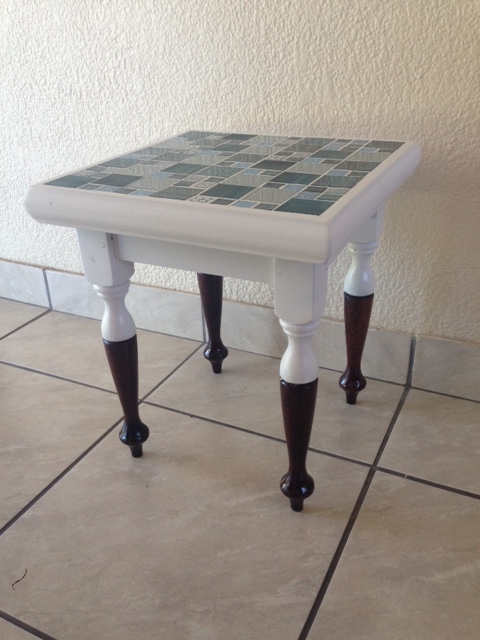 Apply a dipped paint technique to the legs and table top. TIP: Ensure painters tape is used to get a crisp clean line around each leg. 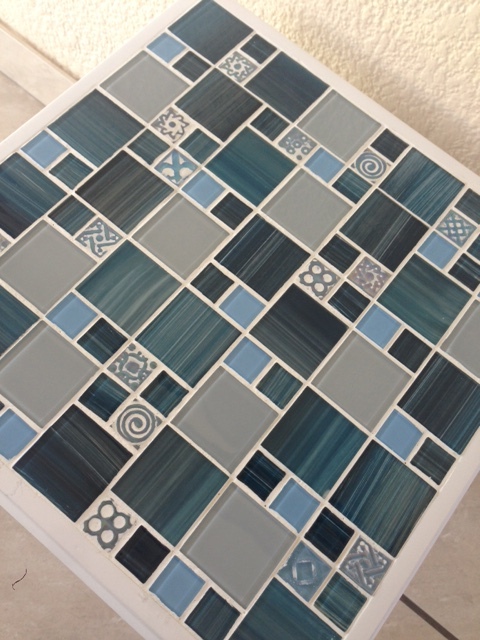 Secure the mosaic tile in place using mosaic tile adhesive. Look out for a mosaic adhesive that doubles up as grouting. Once the mosaic adhesive/grout has dried, simply wipe the tiles clean using a damp sponge. 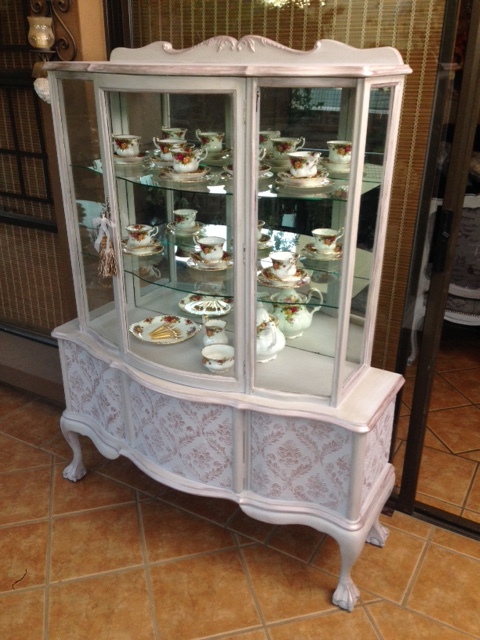 If you have an antique piece of furniture, there are numerous things you can do to turn it into a show piece. Elle renovated an old display cabinet by using wallpaper and paint. Give the entire cabinet an overall sanding. Depending on the quality of the wood, a medium grit sandpaper, followed by a fine grit sandpaper will do. As we will be applying a new coat of furniture paint, we are only looking to smooth down the surface. After sanding, remove any dust by wiping the cabinet with a cloth. To add interest and detail to the cabinet doors and side panels, Elle uses an embossed wallpaper that is cut to size. 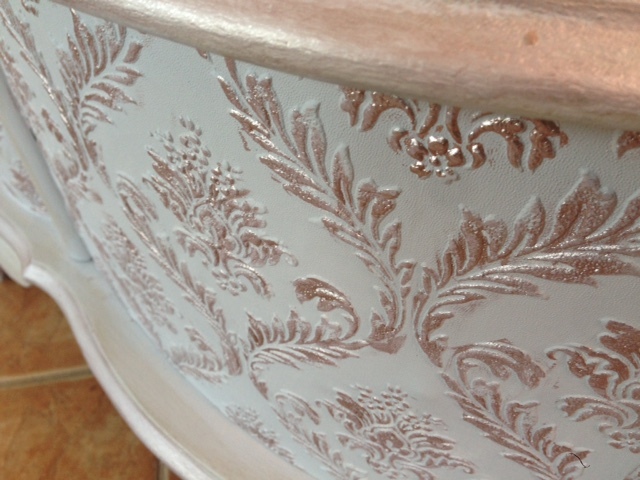 Simply paint a coat of modge podge on the back of the wallpaper and apply to the relevant area of the cabinet. Using a crafter’s knife, simply cut any excess wallpaper away to neaten up it’s appearance. Mask off the glass panels before applying two coats of the desired furniture paint. Always be sure to follow the instructions on the relevant product packaging, as some products do require priming. Once the two coats of furniture paint is dry, you can decide if you want to add a bit of drama and sparkle, by adding touches of antique liquid and metallic paint. This can bring interest to unique features of the furniture piece, like curves and edges. To ensure the glass looks crisp and clean, remove any paint that might have landed on the glass using a glass scraper and wipe the glass with mineral turpentine and a cloth.